This article is about a horse breed. For the Turkmen tribe, see Teke (Turkmen tribe). The Akhal-Teke (/ˌækəlˈtɛk/ or /ˌækəlˈtɛki/; from Turkmen Ahalteke, [axalˈteke]) is a horse breed from Turkmenistan, where they are a national emblem. They have a reputation for speed and endurance, intelligence, and a distinctive metallic sheen. 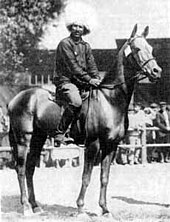 The shiny coat of palominos and buckskins led to their nickname "Golden Horses". These horses are adapted to severe climatic conditions and are thought to be one of the oldest existing horse breeds. There are currently about 6,600 Akhal-Tekes in the world, mostly in Turkmenistan and Russia, although they are also found throughout Europe and North America. Akhal was the name of the line of oases along the north slope of the Kopet Dag mountains. It was inhabited by the Tekke tribe of Turkomans. There are several theories regarding the original ancestry of the Akhal-Teke, some dating back thousands of years. It is probable that Akhal Teke is a descendant of an older breed known as the Turkoman horse, and some claim it is the same breed. The tribes of Turkmenistan selectively bred the horses, recording their pedigrees orally and using them for raiding. The breed was used in the losing fight against the Russian Empire, and was subsumed into the Empire along with its country. The Turkoman has influenced many other breeds, including modern warmbloods, and recent research confirms that Turkoman stallions made significant contributions to the development of the Thoroughbred. However, there also exists the possibility that all Akhal-Tekes today have a Thoroughbred sire line. The studbook was closed in 1932. The Russians printed the first stud book for the breed in 1941, including over 700 horses. The Akhal-Teke typically stands between 14.2 and 16 hands (58 and 64 inches, 147 and 163 cm). These horses are well known for those individuals who have a golden buckskin or palomino color, a result of the cream gene, a dilution gene that also produces the perlino and cremello colors. A number of other colors are recognized, including bay, black, chestnut, and grey. Aficionados of the breed claim that the color pattern served as camouflage in the desert. Many Akhal-Tekes have a natural metallic sheen to their coat, particularly noticeable in those with cream gene colors. Perlino Akhal-Teke. Many members of this breed carry a gene for the cream dilution. The Akhal-Teke has a refined head with predominantly a straight or slightly convex profile, and long ears. It can also have almond-shaped or "hooded" eyes. The mane and tail are usually sparse. The long back is lightly muscled, and is coupled to a flat croup and long, upright neck. The Akhal-Teke possess sloping shoulders and thin skin. The breed is tough and resilient, having adapted to the harshness of Turkmenistan lands, where horses must live without much food or water. This has also made the horses good for sport. The breed is known for its endurance, as shown in 1935 when a group of Turkmen riders rode the 2500 miles from Ashgabat to Moscow in 84 days, including a three-day crossing of 235 miles of desert without water. The Akhal-Teke is also known for its form and grace as a show jumper. The quality of the Akhal-Teke horses are determined by the studbook manager. Depending on type, conformation, pedigree, quality of offspring and achievement in sport, the horses are designated as either Elite or Class I or Class II. There are usually 2 annual grading events in Moscow, Russia called the "International Sport Meeting and World Championship “Heavenly Argamak”" and "Golden Akhal-Teke Cup Shael" where breeders present their best horses to a group of judges. At the World Championship a group of judges evaluate the horses in age and gender categories as well as in various sport disciplines and a halter class. The ancestors of the breed may date back to animals living 3,000 years ago, known by a number of names, but most often as the Nisean horse. The precise ancestry is difficult to trace, however, because prior to about 1600 AD, horse breeds in the modern sense did not exist; rather, horses were identified by local strain or type. The breed is very similar to, and possibly the direct descendant of the Turkoman horse, a breed believed to be extinct, though a related strain may be bred today in Iran. Other breeds or strains with Turkoman roots also include the Yomud, Goklan and the Nokhorli. Some historians believe that these are different strains of the same breed. Other ancient strains that may have contributed to the breed included those named the Massaget and Parthian. It remains a disputed "chicken or egg" question whether the influential Arabian was the ancestor of the Turkoman or was developed out of that breed, but current DNA evidence points to a possible common ancestor for both. A substantial number of Arabian mares were reportedly been used to improve the breed in the 14th and 19th century. It is also possible that the so-called "hot blooded" breeds, the Arabian, Turkoman, Akhal-Teke, and the Barb all developed from a single "oriental horse" predecessor. Tribal people in what today is Turkmenistan first used the Akhal-Teke for raiding. The horses were their most treasured possession since they were crucial for income and survival. They selectively bred their horses, keeping records of the pedigrees via an oral tradition. Horses were managed and trained in very specific ways. Stallions were tethered next to the tent while mares and foals were free to seek forage. The stallions were covered from head to tail with up to seven layers of felt, which kept their coat short and shiny. Before raids they were put on a sparse diet to prepare them for the long ride through the desert with no water and hardly any feed. The horses were called Argamaks (divine or Sacred Horses) by the Russians, and were cherished by those who valued their speed and stamina in the desert and loyalty to their owner. Han emperors from China sacrificed armies to obtain just a few of the precious "Argamaks". In 1881, Turkmenistan became part of the Russian Empire. The tribes fought with the tsar, eventually losing. In the process, however, the Russian general Kuropatkin developed a fondness for horses he had seen while fighting the tribesmen, founded a breeding farm after the war and renamed the horses, "Akhal-Tekes", after the Teke Turkmen tribe that lived around the Akhal oasis (near Geok Tepe). The Russians closed the studbook in 1932 which included 287 stallions and 468 mares. Stallions are not gelded in Central Asia. The studbook was printed in 1941. 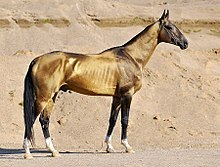 The ancestral Akhal-Teke has had influence on many breeds, possibly including the Thoroughbred; the Byerly Turk, which may have been an Arabian, or a Turkoman Horse, was one of the three major foundation stallions of the breed. Three other stallions thought to be of Turkoman origin, known as the "Lister Turk", the "White Turk", and the "Yellow Turk" were among a number of minor stallions from the orient who contributed to the foundation bloodstock of the Thoroughbred breed. 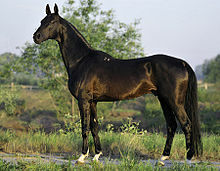 The Trakehner has also been influenced by the Akhal-Teke, most notably by the stallion, Turkmen-Atti, as have the Russian breeds Don, Budyonny, Karabair, and Karabakh. The breed suffered greatly when the Soviet Union required horses to be slaughtered for meat, even though local Turkmen refused to eat them. At one point only 1,250 horses remained and export from the Soviet Union was banned. The government of Turkmenistan now uses the horses as diplomatic presents as well as auctioning a few to raise money for improved horse breeding programs. 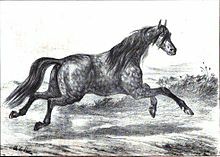 In the early twentieth century, crossbreeding between the Thoroughbred and the Akhal-Teke took place, aiming to create a faster long-distance racehorse. The Anglo Akhal-Tekes were not so resilient however, as their Akhal-Teke ancestors, and many died due to the harsh conditions of Central Asia. After the 2,600 mile endurance race from Ashkabad to Moscow in 1935, when the purebreds finished in much better condition than the part-breds, the studbook management decided to consider all crossbred horses born after 1936, as not purebred. Horses with English Thoroughbred ancestors born prior to that date were allowed to remain inside the studbook (e.g. 044 Tillyakush, grandson of Thoroughbred Burlak, 831 Makh, granddaughter of Thoroughbred Blondelli and great-great-granddaughter of Thoroughbred Junak, and line founder 9 Ak Belek, a direct descendent in the male line of the Thoroughbred stallion Fortingbrass). Due to this fact there doesn't exist any Akhal-Teke today whose ancestry doesn't contain a Thoroughbred. Since 1973, all foals must be blood typed to be accepted in the stud book in order to protect the integrity of the breed. From 2014 on, a DNA test based on hair follicles is sufficient if the DNA of the parents is on file. A stallion not producing the right type of horse may be removed. Nowadays, artificial insemination is allowed as well as embryo transfer. The surrogate mother, however, needs to be a pureblood Akhal-Teke mare for the foal to be registered in the General Studbook as a pureblood Akhal-Teke. Akhal-Teke horses are bred all over the world. In addition to Turkmenistan there are breeders in Russia and Central Asia, Europe, the USA, Uruguay, and Australia. From a race at the national horse-racing stadium in Ashgabat, Turkmenistan. Normally all horses competing here are Akhal-Teke horses. Turkmenistan has a separate agency, Turkmen Atlary, responsible for the breeding, training and maintenance of Akhal-Teke horses. However, the agency's work has been the focus of criticism from the President of the country, who holds the agency responsible for decreasing numbers of horses and inadequate facilities for their breeding, training and management. At present Akhal-Teke horses in Turkmenistan are not registered with any other studbook. The main reason for this are allegations of a heavy infusion of Thoroughbred blood into the breed to create faster horses for racing in Turkmenistan. There are estimates that as many as 30% of the horses in the Ashgabat hippodrome were not purebred. When the first horse minister of newly-independent Turkmenistan, Geldy Kyarizov, a lifelong advocate for the Akhal-Teke and former chair of the International Association of Akhal-Teke Breeders, began utilizing DNA to establish an Akhal-Teke studbook, he uncovered the pattern of adding in Thoroughbred blood. His decision to go public with this information was viewed as a threat to the profits of the horse-breeding establishment and he fell out of favor with the Turkmenistan government, and in particular, then-President Saparmurat Niyazov. He was charged with abuse of office and negligence in 2002, convicted and sentenced to six years in prison. He was ultimately pardoned in October 2007, when Niyazov died and his successor, Gurbanguly Berdymukhammedov, took control of the country. By 2012, Kyarizov's health, which had been poor since his arrest and subsequent imprisonment, had deteriorated to the point he needed to go abroad for medical care, but was initially prevented from leaving the country. By 2015, he was allowed to travel to Moscow for medical care, but family members, including his 14-year-old daughter, were forced to remain behind to "guarantee" his return. Ultimately, in September, 2015, the entire family was allowed to leave. The Akhal-Teke, due to its natural athleticism, can be a sport horse, good at dressage, show jumping, eventing, racing, and endurance riding. A noted example was the Akhal-Teke stallion, Absent, who won the Grand Prix de Dressage at the 1960 Summer Olympics in Rome, while being ridden by Sergei Filatov. He went again with Filatov to win the bronze individual medal in Tokyo in the 1964 Summer Olympics, and won the Soviet team gold medal under Ivan Kalita at the 1968 Summer Olympics in Mexico City. However, by today's studbook standards he wouldn't be admitted as Akhal-Teke, owing to the Thoroughbred ancestry of his dam Bakkara. There are several genetic diseases of concern to Akhal-Teke breeders. The genetic diversity of the breed is relatively low with an AVK (Ancestor Loss Coefficient ) of 30-50%,[dubious – discuss] which raises concerns for dealing with an increase in carriers of these conditions, and even some risk of inbreeding depression. [unreliable source?] To date, there are no DNA tests for these conditions. Naked Foal Syndrome or Hairless Foal Syndrome is believed to be a monogenic autosomal, lethal recessive gene in the Akhal-Teke breed. Foals with this condition have been reported since 1938. Research at the University of Bern in Switzerland is ongoing to develop a DNA test for the condition. It appears to be similar in clinical signs, though not identical to, junctional epidermolysis bullosa (JEB) found in the Belgian horse and another condition of a similar nature identified in the American Saddlebred. The defect causes foals to be born without any hair coat, mane or tail. In some cases, the front teeth are in at birth or molars grow abnormally from normal jaws. Other symptoms include persistent diarrhea, frequent digestive disorders, and laminitis-like, treatment-resistant rotation of the coffin bones in the hooves. Due the lack of normal skin protection, secondary symptoms include scaly, dry, and inflamed skin, as well as severe cases of sunburn in summer, and frequent pulmonary infections during winter. NFS is always fatal, most foals die within weeks of birth, although some horses have survived up to the age of two years. Early demise is usually caused by digestive problems, whereas older horses need to be humanely euthanized because of severe laminitis-induced pain. Some carriers have been identified, including 943 Arslan, 736 Keymir, 2001 Mariula, or 1054 Gilkuyruk, but the estimated number of unknown cases is likely higher, as several Russian and Turkmenian breeders have acknowledged that NFS foals are often just reported as stillborn or aborted. Hereditary cryptorchidism exists within the Akhal-Teke breed and affected stallions can be traced through multiple generations. The influential foundation sire, 2a Boinou was a cryptorchid according to experts of the breed. Other verified cryptorchids include 779 Peren, 1248 Orlan, 971 Khalif, Sayvan, Saburbek, and Garayusup. 1069 Kortik produced a cryptorchid. Unlike many European and North American breed organisations, neither Russia nor Turkmenistan bar cryptorchids from breeding. Cryptorchidism is said to be related to health and behavior problems. Affected horses are more expensive to castrate. There are no studbook regulations related to the use of cryptorchid stallions. Breeders balance the risk of cryptorchidism against propagating other desirable qualities. Some national Akhal Teke associations, however, ban Cryptorchidism from breeding. The Akhal-Teke is one of many light riding horse breeds that may be prone to cervical vertebral malformation (CVM), commonly called Wobbler syndrome, and to Degenerative suspensory ligament desmitis (DSLD). These conditions are seen in a number of other breeds, including the Thoroughbred. There is likely a genetic component to Wobbler's, but the mechanism has not been clearly identified. There also is a possible connection to Osteochondritis dissecans (OCD). Akhal-Tekes are represented in the official coat of arms and banknotes of Turkmenistan, as well as on stamps of Turkmenistan and other countries. In different cities of Turkmenistan are monuments to the Akhal-Teke. The largest number of sculptures located in Ashgabat. ^ "Permanent Mission of Turkmenistan to the United Nations, Country Facts". Un.cti.depaul.edu. Archived from the original on May 9, 2008. Retrieved June 12, 2007. ^ Cieslak, Michael, et al. "Origin and history of mitochondrial DNA lineages in domestic horses." PLoS One 5.12 (2010): e15311. "Eleven out of these 39 haplotypes were lineages that were confined to a single primitive breed (B/Arabian; D2d/Cheju; G1/Akhal Teke; H/Garrano; H1/Marismeno; H1a/Lusitano; K2b1/Sicilian Oriental Purebred; K3b/ Yakut; X1/Pottoka; X2a/Debao; X3c/Lusitano; X5/Fulani). " Cieslak, Michael; Pruvost, Melanie; Benecke, Norbert; Hofreiter, Michael; Morales, Arturo; Reissmann, Monika; Ludwig, Arne (2010). "Origin and History of Mitochondrial DNA Lineages in Domestic Horses". PLOS ONE. 5 (12): e15311. doi:10.1371/journal.pone.0015311. PMC 3004868. PMID 21187961. ^ Wallner, Barbara (July 10, 2017). "Y Chromosome Uncovers the Recent Oriental Origin of Modern Stallions". Current Biology. 27 (13): 2029–2035. doi:10.1016/j.cub.2017.05.086. PMID 28669755. Retrieved July 30, 2017. ^ "The Akhalteke Horse of Turkmenistan". Embassy of Turkmenistan. Archived from the original on July 28, 2013. Retrieved July 28, 2013. ^ "Horse Color". Akhal-Teke Association of America. Archived from the original on December 15, 2013. Retrieved July 28, 2013. ^ Leisson, K., et al. "Myosin heavy chain pattern in the Akhal-Teke horses." animal 5.5 (2010): 658. ^ "History of Akhal-Teke horse breed. Official website of International Association of Akhal-Teke Breeding (MAAK)". Maakcenter.org. May 30, 2001. Archived from the original on May 19, 2013. Retrieved November 19, 2012. ^ "Akhalteke.info". Akhalteke.info. Archived from the original on March 2, 2012. Retrieved November 19, 2012. ^ Wallner, Barbara; Vogl, Claus; Shukla, Priyank; Burgstaller, Joerg P.; Druml, Thomas; Brem, Gottfried; Ellegren, Hans (April 3, 2013). "Identification of Genetic Variation on the Horse Y Chromosome and the Tracing of Male Founder Lineages in Modern Breeds". PLoS ONE. 8 (4): e60015. doi:10.1371/journal.pone.0060015. PMC 3616054. PMID 23573227. ^ Filipov, David (April 5, 1998). "A Long Way to Go". Boston Globe. Archived from the original on October 21, 2012. Retrieved June 12, 2007. ^ Shimbo, Fara (1998). ""The Akhal-Teke under Soviet Rule." Friends of the Turanian Horse". Turanianhorse.org. Archived from the original on February 16, 2012. Retrieved June 12, 2007. ^ a b Putz, Catherine (September 22, 2015). "Turkmenistan Holds 14-Year Old Hostage". The Diplomat. Retrieved August 30, 2016. ^ a b Sharipzhan, Merhat (December 5, 2015). "'Torture By Hunger': Horse Breeder Describes Desperate Days In Turkmen Prison". RadioFreeEurope/RadioLiberty. Retrieved August 30, 2016. ^ a b "Urgent Action" (PDF). Amnesty International. February 3, 2012. Retrieved August 30, 2016. ^ "Turkmenistan: Land Of The Akhal Teke". Archived from the original on May 29, 2014. Retrieved August 21, 2013. ^ "Genetic Defects and Diseases Akhal-Teke: A Differentiated View". Archived from the original on July 21, 2011. Retrieved January 3, 2009. ^ "Hairlessness / Naked Foal Syndrome (NFS) in the Akhal-Teke". Institute of Genetics, University of Bern. 2016. Retrieved August 30, 2016. ^ "Akhalteke.info". Akhalteke.info. Archived from the original on March 15, 2012. Retrieved November 19, 2012. ^ "Hairless Foal Photos". Ultimatehorsesite.com. Archived from the original on June 10, 2011. Retrieved May 8, 2010. ^ "Citation: Stallion Garaiusup, black, "Young World Champion 2002", was granted a Special Prize for the most expressed breed type, but the jury had to move him to the 8th place because of unilateral cryptorchidism and spavin". Maakcenter.org. Archived from the original on July 19, 2013. Retrieved May 8, 2009. ^ Smith Thomas, Heather (July 1, 2004). "Stallion or Gelding?". The Horse. Archived from the original on March 9, 2014. ^ a b ""Wobbler Syndrome" Akhal-Teke: A Differentiated View". Archived from the original on March 2, 2012. Retrieved January 3, 2009. Wikimedia Commons has media related to Akhal-Teke.